This entry was posted on Friday, December 9th, 2011 at 22:28 and is filed under Barack Obama, GOP Candidates, GOP Establishment, History, Mitt Romney, News, Newt Gingrich, Politics, RINO Alert. 11 Responses to 2012: Will The Progressives Run the GOP? Mark; As I see it your right on with this. Great write up . With General Karl Rove The head of the Republican Gaurd in this country. Pushing for Romney-Obama's brother. Most of the runners are scared of the Trump debate. because they know he will drill them for an answer.Our laws have been writen to make sure that the select few can get very rich at the expence of the rest As there mentor George Soros said A CONTROLED DECLINE of the USA. THANKS MARK KEEP IT UP. Very little truth is taught about the Progressive Party of 2012. And that's been the case for several decades now. It is really not so difficult to see all this coming to fruition. I have been watching all this for some time and the (behind the scenes) agreements and compromises are easily imagined and we do see the results. There is professional and career politicians willing do do most anything to maintain their power and standard of living to the extent of shredding the constitution and enslaving all of us in regulations, executive orders and fear bills. Beware the those complicit as Nazi Germany formed. Many also were taken away. Many of the 1% will not be ready or even believe what is going on. The only protection we have is to vote. Freshmen Republicans blamed for "holding the government hostage", being "terrorists" makes me at least smile a little. Some do realize they were elected to protect our rights and swore the oath to uphold the Constitution and protect the United States from enemies outside and within, of which we now have many showing their true agenda. We must vote for the best that will derail this "fundamental transformation", Nothing is perfect, no one is perfect who is running. But, if you don't vote, you give your rights away, too. The most feared bill passed is the one that "suspicious" persons who "might" be terrorists is the final shredding of our rights. All is in the open now and is a runaway train bearing down on this next year. We must not just watch this happen . We must get to the elections. Great article. This is why we need a real conservative like Governor Palin in this race. Great article. That is why we need a real conservative like Governor Palin to get in this race. She is a conservative unlike others who say they are. Great article, Mark. I did not know that the Bull Moose Party was originally the Progressive Party. I read today that only 15% of GOP delegates will be chosen by Super Tuesday. Plenty of time for Sarah to get in (assuming she'd rather not be VP to a big-government statist). 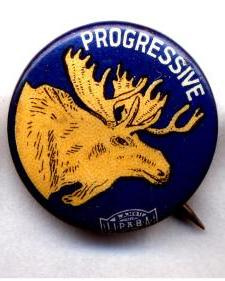 Yes, the "Bull Moose Party" was really just the nickname for the Progressive Party. And you're right: Nothing is settled with the GOP nomination despite all the hoopla to the contrary. Of course progressives are running the Republican party. Palin hinted about this when she spoke about cronyism. In my opinion Palin dropped out because she saw the Country isn't ready for a true conservative and this hurts me to say but i think she's right. When the Republicans are ready for a conservative they'll start grooming one years before the next election and it will be backed by the teaparty, it could very well be Ms Palin. Further to your observation of Sara Palin I feel it is similar to the situation where a weak link has been detected in the chain but no one will address it directly and no one will believe it when it is noted. One has to wait until the chain breaks before the light of reality comes and slaps you upside the head. The wheels have to fall off the wagon before someone says "we got a problem here folks and it pains me to say "I told you so"".